It is a busy Saturday for me. Yesterday was my sister's birthday. Melanie is the youngest in the family and she turns 21 this year so it's a big birthday affair. For weeks we have been figuring the best form of celebration for her and it's finally decided that we're going to have a birthday hi-tea for her and her friends in a hotel here. So this year, since no home cooking is involved, there is no need for me to look up great birthday recipes from my Birthday Cookbooks to prepare a special birthday dessert for the party. I usually buy something for the party but this year since it's her 21st birthday, I was contemplating on making a Strawberry Trifle! Trifle is pretty easy to make and it does not require the usage of kitchen appliances like an oven, blender, much less a Stand Mixer! Like I've mentioned in one of my older posts, I do not own an oven. I only have a microwave oven in my kitchen so my baking and cooking-for-party skills are limited because of this. Perhaps that is one of the reasons I constantly turn to Trifles when dessert is needed for a dinner party or family celebration. I do enjoy cooking quick easy recipes! 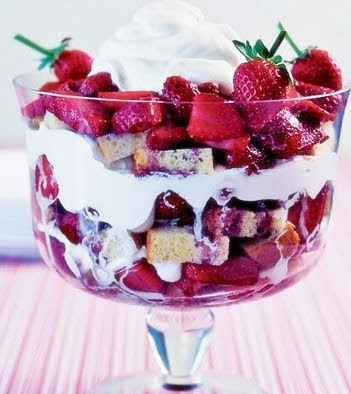 Anyway, I found a Berry Trifle recipe online, which I simply have to try soon. It looks easier to make than the traditional English trifle and it looks berry-licious too! Happy Birthday to Mel once again and I will take some pictures of our hi-tea later this afternoon to share with you. Happy weekend! :* :* :* Bill Meow 1! :-D :-D Ane Meow 2! Happy 21st birthday Mel!!! may your journey to adulthood be joyous and wonderful ya!! Happy 21st birthday to Mel and may her wishes come true. best nya hi-tea... i still remember my 21st birthday.. quiet but best! Looks delicious...but I don't know what a trifle is! I can't imagine not having an oven, we use ours almost every day.